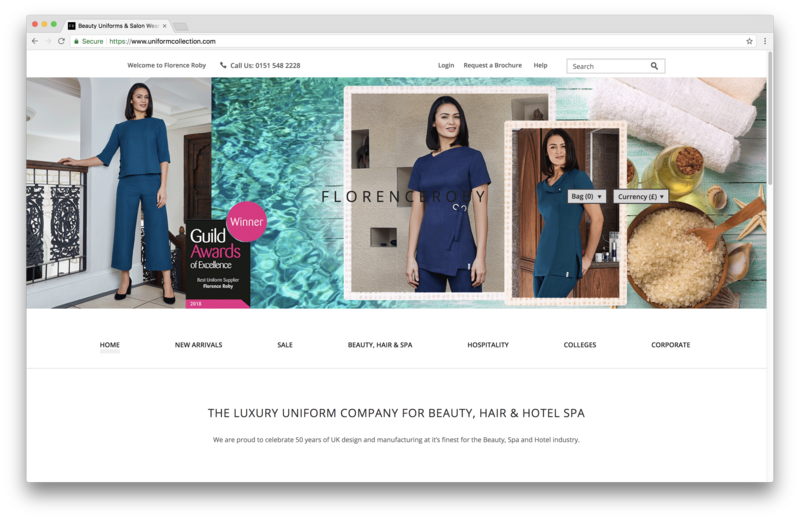 The premier supplier of luxury uniforms for the Hotel Spa and Beauty industry, Florence Roby, required a new integrated Magento ecommerce solution to replace its existing solution that looked aged in design. Additionally, the system was not integrated into Sage 200 which meant a large amount of manual work to update both the ecommerce site and Sage to reflect on and offline sales. A powerful Magento B2B ecommerce solution for Florence Roby, the premier supplier of luxury uniforms for the Hotel Spa and Beauty industry. Magium delivered a joined up and integrated solution with Magento providing a powerful front end linked to Florence Roby’s Sage 200 backend. The system was linked via a connector that catered for updates to Sage and allowed stock levels, pricing information and other data to be updated in real time. The front end designs were created with the target audience in mind and showcase the uniforms and allow Florence Roby to update the site themselves using quick and simple management tools. Integrating Magento with Florence Roby’s Sage 200 back office system immediately delivered efficiencies and freed staff up to concentrate on other activities. The site is robust and delivers a flexible platform for growth. The site has seen impressive growth in sales and conversion rates, particularly on tablet and mobile devices have soared.